Recently, HoneyWorks released a new song, but it had a new voice in it. In the description, this voice was said to be a new “Test VOCALOID3”. This new voice has been dubbed “v flower” for the time being, and the voice has been described numerous times as a power type voicebank with a crisp voice. The tagline for this new test bank is “New VOCALOID3 Up To You”. The voice has been described as genderless, however if you look at the mascot, you can tell that at least the design is feminine, since the small part of the mascot shown in the banner above in fact has a skirt on. A full artwork has not yet been released. You can see her design here. This song was just released yesterday (April 16th), but Flower already has a Twitter account and an Official Site up and running. The signature symbol for this new voicebank also seems to be a bass clef, seeing as it is her Twitter Icon, and also the Favicon on her Official Site. Many well known producers such as Circus-P have already commented on Flower, so that is definitely a good sign for her popularity. 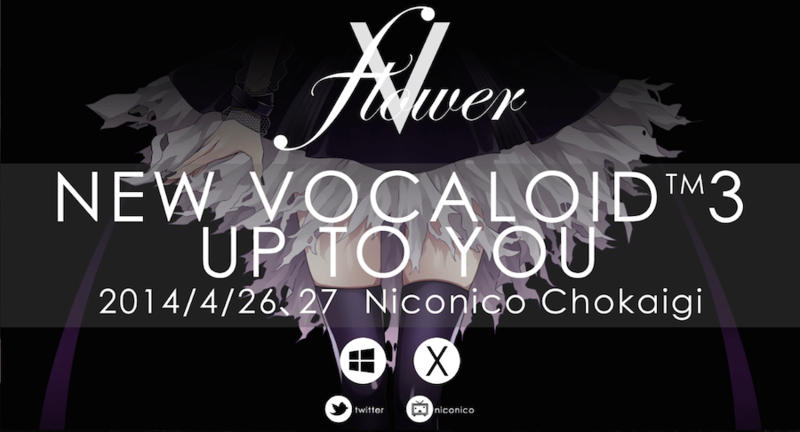 And since both Windows 8 and OS X Mavericks logos can be seen on the banner above, that would suggest that this voicebank will be hybrid-compatible when released. At any rate, Flower has already been well received by the community after just one day, and personally, I am very excited to see what potential she has in store for us. EDIT: She also already has a SoundCloud page up and running. True. But hey, she could bring an interesting style to any genre! I usually go through different stages when i repeat and listen to a song and pay attention to detail and I can really hear doing all types of genres. I really dig it. Hope to see more.